EMF comes only twice in Canada… and once in Montreal. I would I like to see Zac once live on stage. It’s in 1995 you’ve met the band? Thanks you Rumi! I find it so sad that I have never been to a concert . 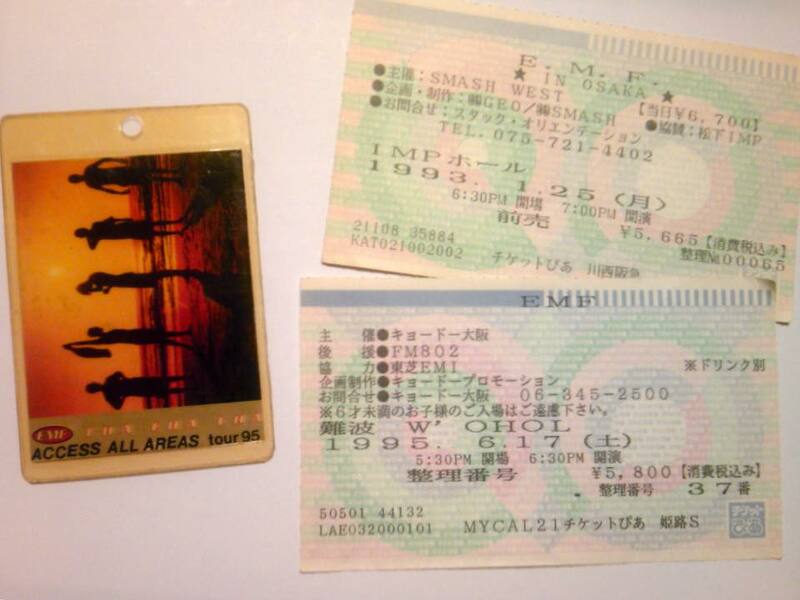 Okay , I was certainly too young and would not have been allowed to visit a concert, but I also do not believe that EMF ever gave a concert in my town. I think EMF were one of a few bands which were able to make great albums and also great concerts. Most of the bands only can do one of both in a very good way. My suggestion is the Reading Festival in 1992, it was marvellous really. Oh yes, watching DVD or VHS you can’t feel the atmosphere, that’s right, sorry to say. I can tell you the atmosphere, though, I think it doesn’t make sense. And Japanese atmosphere were a bit different to the other countries…. Audience were dancing and enjoying, and more close to them sometimes fan and James started to talk something or they really paid attention to the audience. About DVD, I just glanced once Queen Cara made the one, but it’s Astoria I didn’t remember, anyway it was without Zac, so I wasn’t interested in. You can watch lots of EMF PV or live videos at EMF official on YouTube! Here in Japan we have so many pay-channels that you can watch the gigs / concert or Festival from UK or US all the time, they’re like MTV. I can watch Glastonbury or any festivals every year via BBC or so. And we have two big festivals in Japan, Summer sonic Festival and Fuji Rock Festival. Every year so many musicians come from overseas, and my friend from UK keep saying the lineup is too gorgeous than UK’s. So, if EMF still alive they must come I bet. I know what you mean Anja. I also feel the same. I missed a little bit of Schubert Dip era (and their only travel to Quebec). But I recorded (too little) parts of the only Zac and Derry’s interview with our french Canadian V.J.’s at Musique Plus. At least, I can view it on You Tube and also I can buy things on them on ebay (I’ve been able to buy Smoked Then Banger on VHS). Not to mention the brillant work of Cara with EMF officiel web site. Without her, I couldn’t know about Zac’s Carrie Project and lots more. Sorry for my English… I hope you understand guys!